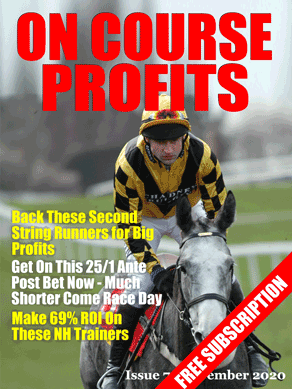 There's a very interesting article in this months On Course Profits magazine which is well worth a read. Our own Friday contributor Nick Hardman looks at how we can make profits from trainers outside of the top stables. One of the trainers Nick recommends following is Harry Fry. Mr Fry has only been training in his own right since 2012 and since then he has had 250 runners, with 71 of those winning. His level stake profit from betting all runners is a very respectable 99.16 points profit. That's at industry SP. So since he started out you could have backed every horse that left his yard and made a whopping 39% return on investment. In the article Nick tells us which races to avoid to bump that up to a 99% ROI. He also investigates the performance and finds winning angles for John Quinn, Malcolm Jefferson, James Ewart, Warren Greatrex and Gordon Elliott. If you've got an Ipad, Iphone or an Android device you can read the whole magazine for free.